Pop this leather cell phone card holder on and enjoy three handy functions in one slim, well-made accessory. It works as a wallet (holding up to three cards), and has a slide-out grip for handier holding that does the job of a kickstand, too. Dimensions: 3.75" x 2.25" x 0.1"
I ordered this is green - very pleasing shade. Very clever and easy to use push-up credit card holder. The 3in 1 Smartphone Grip is so much easier than any of the other choices I had. The ability to lean it and the spot for cards is smart use of space. Ikey Srour and Sam Schneider were at work developing a better cell phone card holder when they had an a-ha moment. 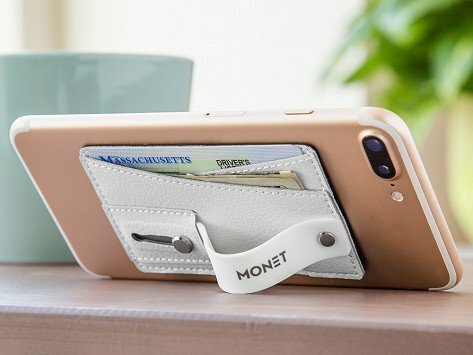 The Monet co-founders realized that the finger grip on their phone wallet doubled as a kickstand, too—further setting their design apart. The functional three-in-one phone wallet is a little bit luxurious, too, which we appreciate. After all, it is something you will stick to your phone and touch every day. It’s made with leather and comes in a bevy of colors to suit your personality (or match your phone case). The adhesive-backed wallet can hold about three cards, and its leather grip slides out when you need it for better phone-holding or better selfie-taking. It can bear a phone’s weight as a kickstand, too, for better, hands-free screen viewing. We love the quality construction and how slim the wallet is. Many of us use something similar on our phones, but felt this one is a stand-out choice.